New this year, we will have Yoga teachers volunteering to lead short sequences of recovery yoga. Mats will be available, but bring your own, if you like. They will be available from 10:30am through 4pm. These sequences are aimed at releasing and stretching typical muscles used while cycling. Alison will also be available to demonstrate and help you use Yoga Tune Up® Balls, which helps relieving areas of tension. Stop by after or during your ride for a wonderful way to reduce tension in your neck, tightness in your legs or stiffness in your back. 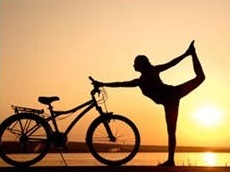 Did you know that Yoga has a lot of benefits for cyclists?